OK, everyone, get ready for what I think may be the greatest addition to the cat product world for 2017! I almost had a heart attack when I saw this, IT IS SO FLIPPIN’ COOL!!!! The Cat Case module measures 36″ wide by 18″ tall and 12″ deep with a 10″ deep access space for your cat. There are three different case designs with different sized openings. You can stack the cases horizontally or vertically to create whatever size and shape of wallscape you desire. Interior passageways are covered in durable carpet so kitty can climb, scratch and lounge. The openings that face forward are closed off from the interior compartments so you can use them for storage or display. 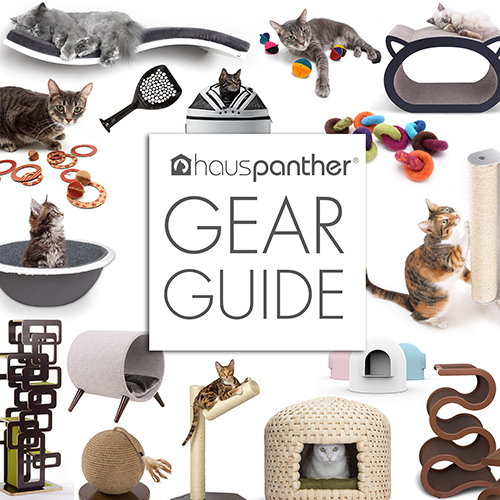 It’s the perfect combination of functionality for both you and your cat and the flexibility and modularity is mind-blowing. And in order to make the product fit a variety of interiors, the cases are available in four different durable melamine finishes: walnut, light grey, white or maple. You can choose a single finish or mix-and-match. I love how you can build a variety of configurations to suit your space. You can create a tall wall unit or a low window perch. The possibilities are endless. And now for the really exciting news, the price! The Cat Case is currently running a Kickstarter campaign and you can score some of these starting at just $75 for a single cat case or $175 for a set of four. For real! The Kickstarter also includes these awesome wall-mounted cat shelves that match the Cat Case. These start at just $50 for a set of three! But go to the Kicksarter page now because some of these deals have limited quantities! I will be sure to keep everyone updated on when this system is available for sale and I’ll be keeping an eye on this company for anything else they do in the future. Enter To Win a Kitty Nap Pad from Tabby James! This is a great idea, however, the first thing that came to my mind is about cat yak. I have 3 cats that tend to hurl quite a bit, as most cats will. What happens when someone yaks in one of the inner portions of the shelf? You’ll have to tear the whole thing down to be able to get to it to clean it up. I think I’ll pass. Thanks for the taking the time to share your thoughts! For homes with cats that often experience nausea, we recommend leaving at least 2 feet of space between full cat cases. As the cases feature 9” interiors, stain-resistant carpeting and silicone backing, this ensures you’re able to get at the mess and it’s easy to clean, even if it’s been sitting a while. Beth, posting before me, does have a point there. But these are gorgeous and so versatile! and maybe they can design them with slide-off front panels for easy interior cleaning. I can see cats spending a LOT of time in these. I’ve been looking for something like this for quite some time as my cats LOVE bookshelves – so I jumped in on the super early 4 unit set! What a bargain! Thanks for bringing this to our attention Kate! This is a really great idea, and just the thing I was looking for as I plan a new “cat wall” area. The Kickstarter doesn’t have a lot of detail about materials, but I’ve enquired about them in the FAQ area & hope to know more soon. The design looks great all around, but my serious concern is the carpeting. I have a cat who is allergic to dust mites, so all carpeting in my house must be able to be professionally cleaned or fully replaced (optimal). The clever design here appears to use carpeting as a structural element, so I’m a bit concerned that it will be glued and thus not replaceable. The price is great compared to some similar pieces I’ve seen from Europe. Thanks for your thoughts! We spoke at much length about how we can help with your issue and may have a solution. Stay tuned for an update in the next week that could be just what you’re looking for! I’m thinking I’d buy the white and end up reselling down the line to help finance a future teak finish purchase at non-Kickstarter prices, LOL. Granted there are definitely varying shades of teak and I have no idea if melamine can approximate a teak finish. However, I’m sure there are others with teak mid century modern furniture in their homes who would also appreciate the option! How do they attach together? Surely they don’t just stack. I can see my cats having a chase/play wrestle/squabble and the whole thing comes down.